What does a person do with one week to go? Check often for indicators of spontaneous and miraculous arterial healing, that's what! I was inside on the treadmill (blah) on a 0% incline just working up some happy low-key non-artery-spasm-inducing sweat. It was so low-key I was able to take this stunningly clear photo of the treadmill display. I was cruising along feeling pretty OK for about 5 miles, so I initiated TEST MODE. I put it on a 4.0 incline at my same cruising pace (7.0) and timed how long it took for SYSTEM SHUTDOWN. The result was less than 4 minutes until the left leg was toast. At least it is consistent. I unconsciously do this every time I walk up the steps too. Again, consistent. 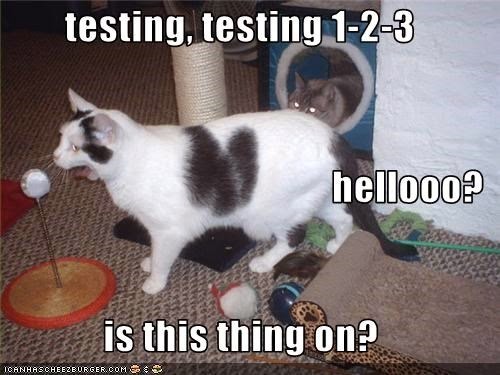 This is what you get when you Google "Testing, testing..." Poor cats are always the subject of ridicule! Anyway, it's just another week of swim, bike, run (sort of). As Coach Jim said, I do it because it's "who I am." That's true! I guess it makes me feel good to know I still want to do these things, even without knowing when my next race is and even knowing I have this interruption coming. So thinking as I type...maybe there are two meanings to this "Testing, testing...." title. Maybe right now it's also a little test of my commitment. Do I really love to swim, bike, and run for their own sake, or do I require the motivation of a race to do and enjoy them? Looks like not. Do you ride clockwise or counter-clockwise?